You are here: Home / body fitness contest / Can Your Fitness Plan Really Get You A Better Body? When asked this question, most people would say, “of course I am!” But if you dig down deep inside, a lot of people mirroring those positive statements actually hide an insecurity — a feeling of maybe not deserving that better body their words say they should. Is it possible you feel this way? There’s no shame if it is, because most people do. Why? Human nature. I’ll give you an example. Have you ever noticed how even the most famous movie stars often go “ga-ga” when meeting other famous actors? The reason is we all idolize others that are publicly known and acknowledged. From actors to politicians or astronauts, when seen or read about from afar, these figures seem larger than life. In reality they’re no different from you or I. Ever notice how often people say after meeting a famous person that, “they seemed so nice, so down to earth.” It was as if they expected them to somehow act “different” and not be at all like “normal” humans. But they are normal, no different than the average person. They just happen to be better known either through their deeds or other societally admirable trait. The point I’m trying to make is, often, many that are trying to get in shape look at others that are in shape and say to themselves, “I can’t ever look that way”. They unknowingly sabotage themselves before they ever start by erecting a mental roadblock. They reason, “those people are genetically gifted and can get in shape easily”. These people have also struggled to get in shape all their lives so they think they must be different. While it’s true there are differences in the rate at which everyone loses fat and gains muscle, and hormones can play a role, those differences are subtle. EVERYONE can lose fat, gain lean muscle, and get into great shape. It doesn’t matter what age you are, you can get into great shape…Really! What I want you to come away from today is the realization that it is possible for you to use a good fitness plan and get into really good shape. You are no different from I or anyone else that is fit. I’ll remind you that before I won the 1998 EAS Physique Transformation Contest (Body For Life contest as it’s called today), I had already been working out for 8 years. Yet I looked like I hadn’t worked out a single day in my life. If there was anyone that could complain about having bad genetics it was me. Yet, in a matter of months I completely turned my body and life around. After winning I was featured in Muscle Media magazine, had a new Corvette, money, and was on top of the world. People looked up to me and used my body as an example for the one they wanted. Yet, I hadn’t really changed on the inside. I was still the same person that had struggled just a few short months before, desperately trying to figure out a way to finally get in shape. In reality, I knew how to get in shape all along. 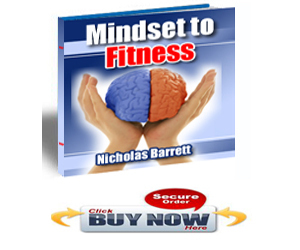 I had gained a vast amount of knowledge from the previous 8 years where I studied everything I could get my hands on about getting in shape. The only thing I did differently was I finally applied that knowledge into a fitness plan that worked for someone like me, a “hard-gainer”; someone that struggled to lose fat and gain lean muscle. Also, I “chose” to get in shape. I got rid of the mental roadblocks and just did what I knew needed to be done to get in shape. You and I see how ludicrous this sounds. I mean, there is no invisible force turning the steering wheel of his car into the drive-thru of a McDonald’s, or telling the order person he wants a hamburger, or paying for it and then eating it. Yet he said it with complete seriousness. Yet I bet if you videotaped his life you would see him tell others that he’s trying to lose weight and get in shape before but no matter what he tries the fat just doesn’t want to come off. He’s lying to others, of course, but even worse is he’s lying to himself. Choice…that’s all it boils down to. Yes, you may be looking for the right fitness plan to get you there, but unless you act upon what you find, it’s all for naught.